We get down and dirty with the Volvo Trucks FMX line-up, a better looking and ballsier version of the popular Volvo Trucks FM range. It's not often that someone gives you the keys to a brand new truck and then encourages you to get it dirty. However, at the launch of Volvo's new FMX, I not only got dirty with the new construction spec model, I managed to do it with a rather evil smile on my face. There was a perverse pleasure to be had in covering the new range in a shower of mud and water. Maybe it's because I knew I didn't have to wash them afterwards or maybe it just appealed to an unpleasant part of my personality. And, of mud there was plenty as sheets of rain lashed the Melbourne 4x4 training centre venue located near Werribee, Victoria. In fact, there was so much of the wet stuff descending from the heavens it curtailed the drive program somewhat as conditions made a task as simple as walking a treacherous undertaking. 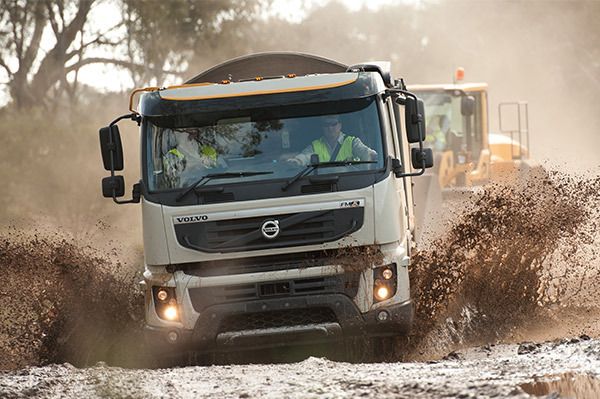 The new FMX construction range from Volvo represents an extension of the hugely successful FM. Effectively a cosmetically beefed up FM, the new model has been kicking goals globally since its inception. It seems that countries whose economic success is riding on digging big holes are also digging the FMX. 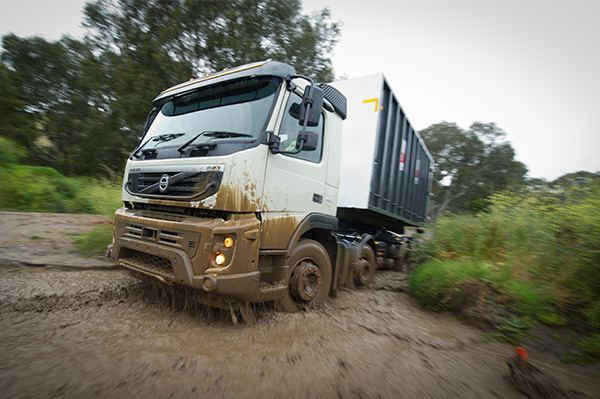 Available in 6x6, 8x4 and 6x4 configurations, the new truck has finally been introduced to the Australian marketplace after being rolled out in other markets around the globe. In a sense, you can't help but wonder if it was entirely necessary, with the FM having proved its flexibility both on and off road in a range of roles since its introduction. In fact, the FM has been working up a sweat in the mines and palm oil plantations of Papua New Guinea and Indonesia with success for a number of years now. But, as with other companies who supply equipment to a variety of industrial applications, Volvo are also taking the opportunity to bridge the gap between their earthmoving and truck range with the FMX. 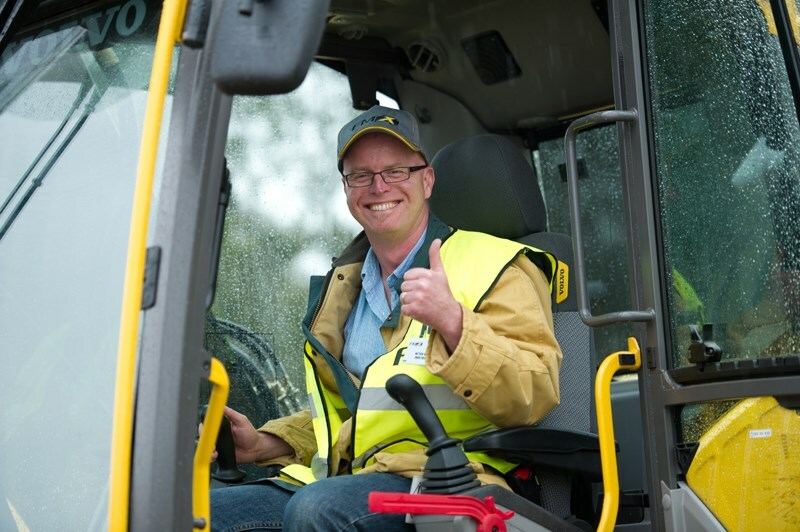 Volvo trucks Australia General Manager Gary Bone states: "A quick glance at this truck and its dominant stance reveals the close connection between Volvo Trucks and our sister company, Volvo Construction Equipment, among the world leaders in dumpers, excavators and wheel loaders". "The new, purposely-engineered Volvo FMX exudes confidence, reflecting its capabilities inside and out," Bone adds. At first glance, I can't help but agree with the company line. On the surface, the FMX does indeed look the part. A three-part steel front bumper with 3mm thick outer corners accentuates the look, along with a skid plate underneath. But the dominant feature out front is the 25-tonne rated towing pin. The centrally located tow pin is one of those low-tech features that is beautifully simple but exceedingly handy, once you know you've got it. To accommodate the strengthened front end, the bumper stands 16.5cm further out than the FM. This also makes room for a non-slip step to make access to the windscreen easier. This makes rocking the truck free of a bog a hell of a lot easier and gives the driver a lot more control when manoeuvring on a slippery site. 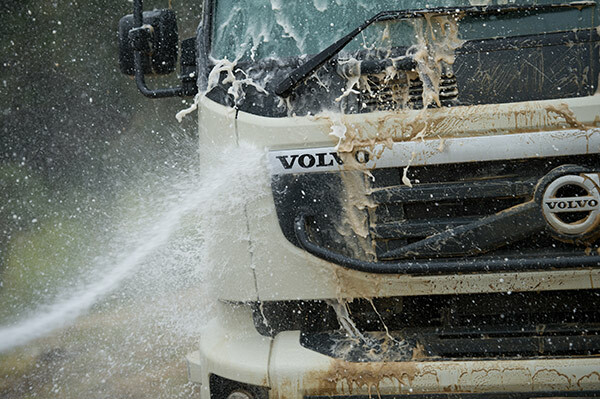 As far as the bouncy bits go, leaf springs both parabolic and conventional are available for rear end suspension and, in the braking department, the 6x4 and 8x4 trucks are fitted with Volvo's EBS disc brakes. The 6x6 version however, comes out of the box with Z-cam drum brakes and ABS. Unsurprisingly, diff locks also come with the FMX package along with a choice of single-reduction and hub-reduction rear axles which will handle a load of 23 to 32 tonnes respectively and provide a GCW of 70 tonnes. Of course, given some of the demanding applications the FMX is destined to fill, mining for example, there is always the possibility of engineering the vehicle to a higher GCW. 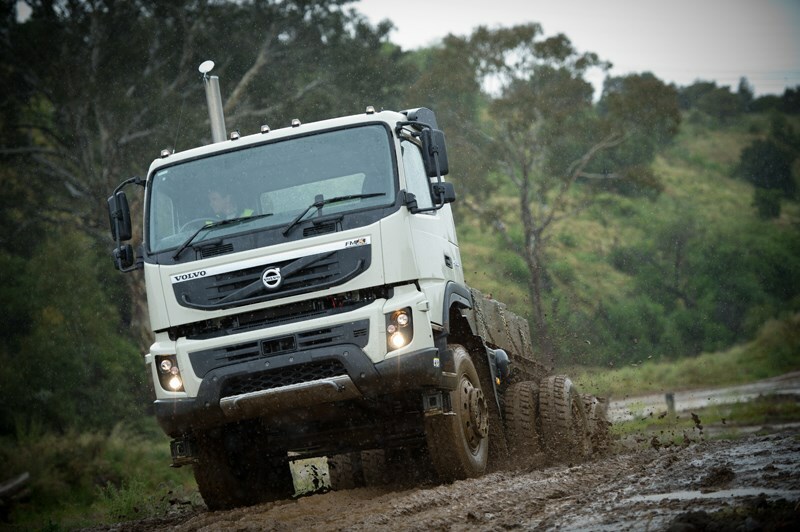 Volvo provided one example of an Indonesian 10x4 set up operating off road at a GCW in the vicinity of 60 tonnes. Engine-wise, the new truck differs little from its black top running counterparts with the availability of 10.8-litre D11 SCR engine and, further up the horsepower scale, the 12.8-litre D13. Both units are easily optioned with an engine mounted power take off unit. Volvo's VEB engine brake features on both power plants, providing a more than respectable 290 to 375 'killer wasps' of braking power at 2,000rpm, which could come in very handy when crawling down haul roads at maximum weight. In the FMX, both engines develop peak torque and horsepower high up in the rev range above 1,500rpm, ensuring that the driver has all the ponies they need in the rough stuff with the right foot planted on the go pedal. As far as transmissions go, both the traditional 14-speed manual and 12-speed I-Shift automated gearboxes are available. Though, as Gary Bone explains, I-Shift installations account for 96 percent of all Volvo orders these days making the manual box a rarity. Also available is Volvo's range of 6-speed Powertronic torque converter transmissions which will keep the waste industry on side. I couldn't help but look at that new beefy bumper out front and think it would be just the thing for shunting pesky obstacles (prestige cars, fences, parking meters, etc.) out of the way when trying to access a bin with a hook lift or front lift garbage truck. Given the popularity of the I-Shift AMT, it comes as no surprise that in this application the box now comes with new off-road specific software which gives the truck maximum torque where possible at low speed, making the FMX easier to live with in the slush. While this mainly affects gear shift patterns, one standout feature is the ability to switch straight from forward to reverse and vice versa at low speed. Some if the features unique to the FMX include a new headlight cluster which can be encased in a protective mesh and also separate lenses that are able to be replaced individually. 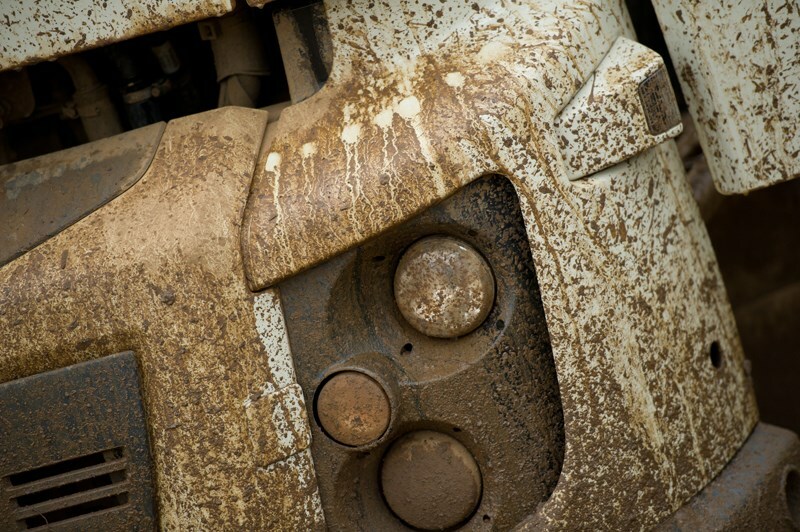 A higher air intake position also helps keep the engine breathing clean air off-road. However, it's the little details that give the FMX some credibility in the dirt. Anti-slip material has been fitted to the cab instep and a grab rail and ladder are fitted to day cab models, meaning a driver can swing out of the cab and onto the ladder to check out the load, without having to set foot on the quagmire below. Pop out headlight washers, to help keep the headlights clear as a bell, are another option available. I was rather taken with the look of the redesigned headlights and I couldn't help but wonder how long it will take for someone to bling up their road-going FM or FH with the new light cluster. With the sometimes torrential rain showing no signs of abating, it came time to brave the elements. First stop was the imposing 6x6 rigid. With its elevated stance and skid plates it looked every bit the off road hero. Once I'd scaled the dizzy heights into the cab I could have been sitting in any road-going FM as, aside from the view, there was little to differentiate it from its blacktop brethren. One neat addition to the FMX are rubber floor mats with a raised lip running around their perimeter, a great idea to help prevent dirt and mud from migrating around the truck cab from the driver's boots. Of course, the first thing I wanted to do was find the steepest obstacle I could and drive the six-wheeler up it, but with the whole venue streaming with water I guess the folks from Volvo were, understandably, a little bit nervous as to what side up their vehicle would be on the way back down. Bearing this in mind I had to be content with a wander around the mud pit, a task that the 6x6 took in its stride without raising a sweat. The all-wheel drive 6x6 is the only member of the FMX family that isn't built in the Australian plant, based at Wacol in Queensland, and is brought in fully assembled from Swedish shores. With the mining boom in full swing you don't have to be a rocket scientist to predict that the all wheeler will be aimed at a number of ore extracting roles. It's easy to see the 6x6 platform able to tackle tasks from exploratory drilling and mobile workshop duties to hauling dirt at the lighter end of the spectrum. The other role not actually mentioned would be its suitability for military duties. While the Australian Defence Force may not be a high volume market, it doesn't take much imagination to picture the 6x6 in army green. Next stop was a spin in the 6x4 tipper which proved quite agile with the diff locks engaged, despite its relatively short wheel base. That the mud carter was loaded at the time helped give a bit of perspective on the tipper's off-road manners, although conditions prevented me from getting too carried away on the narrow, muddy tracks. As I barged my way through some native vegetation, I also noted the FMX's mirror housings which have been simplified and pared down for this application. This makes them capable of withstanding a decent whack without resulting in an expensive replacement job. That being said they still provided a good view down the sides of the truck without filling the up-the-side windows. I also took the 8x4 for a jaunt around the off-road circuit. The eight-wheeler was set up as a hook lift bin truck and was running with an empty bin on the back. The 8x4 still proved itself quite manoeuvrable in the slush with the traction control switched off, although engaging the diff locks for a bit of grip encouraged the truck to plough on ahead regardless of what direction the steer axles were pointing in. Of course, plough understeer in muddy conditions is a common occurrence with unladen site vehicles. 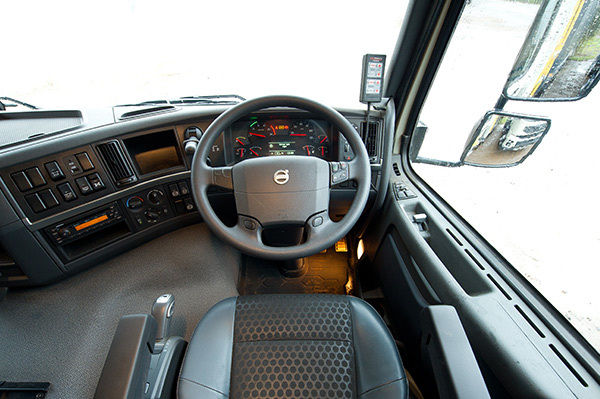 I did, however, manage to execute a three-point turn at one stage without touching the brake pedal, which proved the flexibility of the I-Shift. It was simply a matter of flicking the gear selector from forward to reverse on the fly and the truck grabbed the appropriate gear and changed direction without any fuss. 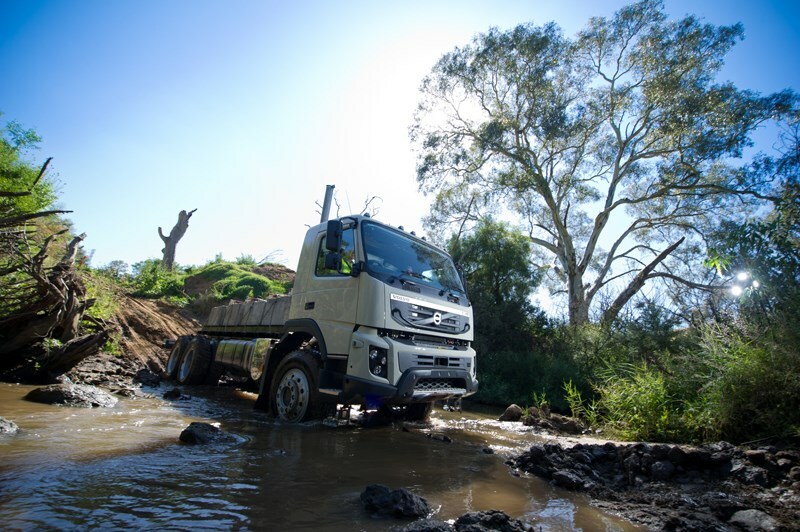 The off-road sensibilities of the FMX's I-Shift programming made it as similar to operate as some hydrostatic transmissions found in earthmoving equipment such as wheel loaders and dump trucks. In a site environment I would imagine that this would make jumping from one machine to another a piece of cake. Speaking of other equipment, I couldn't resist jumping behind the controls of a 21-tonne excavator that just happened to be present. In keeping with the whole 'Tonka trucks in the sandpit' theme, I took the opportunity to dig a hole … and fill it in again … and dig another hole, and … well, I'm sure you get the picture. My brief spin in the FMX range confirmed my initial impressions. It is, in effect, an FM wearing work boots, a hard hat and safety vest. And I'm sure that if you spoke to it the wrong way it would kick you off site for not carrying your induction card. With the basic package coming in as a $5,000 premium above the FM, depending on specification, Volvo appear to have found a viable niche for those operators wanting a tough truck as competent off the tarmac as on.